Sid Meier's Civilization IV: Colonization, a "reimagining" of Meier's 1994 strategy classic, is now in development at Firaxis Studios, 2K Games announced today. Players will take control of one of four European powers as they compete to conquer and colonize the New World. Negotiations, trading and warfare will figure prominently as players maneuver for power and struggle to gain their freedom and independence. The new game, redesigned to take advantage of the power of the Civilization IV engine, will bring added depth to the game via a new interface, improved diplomacy options and a suite of modding tools. "We've received many requests from fans over the years to bring back Colonization and now seemed to be the perfect time to do that," said Meier, a renowned designer and director of creative development at Firaxis. "The Civilization IV engine provided a fantastic foundation for a new Colonization experience and allowed us to create something great for both new players and long-time fans of the game." Sid Meier's Civilization IV: Colonization is being designed exclusively for the PC, and is slated for launch in fall 2008. 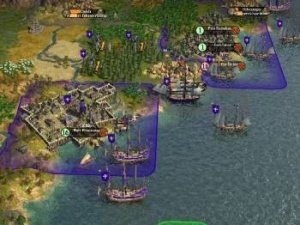 The new game will not require the original Civilization IV in order to be played. To learn more, keep an eye on www.civilization.com.